Astronomers announced the discovery of an exoplanet with 8.47 times Earth’s mass and twice Earth’s radius in the 40 Eridani star system, distant 17 light-years from our Sun. In the Star Trek universe, the Eridani constellation is mentioned as the star system where the planet Vulcan, homeworld of Commander Spock, is located. In the original Star Trek series the location of Vulcan wasn’t identified. Vulcan was mentioned as planet various times in the first season, but it was only in the the second season episode “Amok Time” that it was visited by Commander Spock, Captain Kirk and chief medical officer McCoy. Vulcan was shown as an Earth-sized world, mostly covered by deserts and mountains, with a red sky glowing above a barren landscape. As it orbits its sun on a very narrow orbit, its surface temperatures are higher than Earth’s. Also, the atmosphere is very thin, barely breathable, and non-Vulcans have a hard time adapting to the harsh environment. 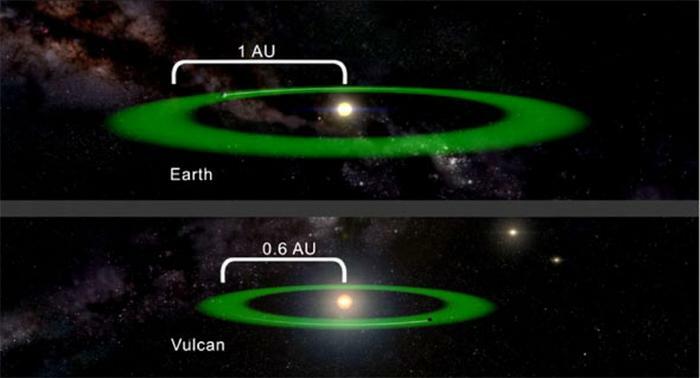 According to Star Trek lore, the desert-planet Vulcan orbits its sun together with the planet T´Khut, a geologically active lava planet. In the movie Star Trek II: The Wrath of Khan, released in 1982, the star 40 Eridani A was mentioned as Vulcan’s sun. In 1991, Gene Roddenberry, creator of Star Trek, published a short article together with astrophysicists Baliunas, Donahue and Nassiopoulos, arguing that the constellation of Eridani would be the most fitting place for Vulcan. Next PostThe Hippies Were Right: It’s All about Vibrations, Bro!